Fig. 4.1. Wheatstone bridge circuit used for the measurement of resistance and capacitance in parallel. Fig. 4.2. The time course of the impedance change during the conducted action potential in a squid giant axon recorded by Cole and Curtis (1939). a, double exposure of the unbalance of the impedance bridge and of the monophasic action potential at one of the impedance electrodes; the time marks at the bottom are 1 ms apart. 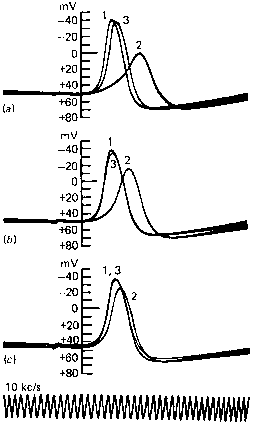 b, superimposed plots of the membrane conductance increase (C) and of the action potential (AP) after correction for amplifier response. membrane potential did not just fall towards zero at the peak of the spike, but instead was reversed by quite a few mV. This unexpected overshoot could not possibly be accounted for by any hypothesis involving a reduction in the ionic selectivity of the nerve membrane, but required a radically different type of explanation. None was forthcoming until in 1949 Hodgkin and Katz put forward the sodium hypothesis of nervous conduction. Noting that because the external sodium concentration [Na]0 is greater than the internal concentration [Na];, the Nernst equilibrium potential for sodium (ENa) is reversed in polarity compared with Ek, they suggested that excitation involves a rapid and highly specific increase in the permeability of the membrane to Na+ ions, which shifts the membrane potential from its resting level near EK to a new value that approaches ENa. The first piece of evidence in support of this theory was the fact that nerves are indeed rendered inexcitable by sodium-free solutions. As Overton showed long ago for frog muscle, only Li+ ions can fully replace Na+, though it is now known that there are several small organic cations like hydroxyl-amine which can act as partial sodium substitutes; and certain excitable tissues have a calcium-dependent spike mechanism. As may be seen in Fig. 4.3, replacement of part of the external sodium by glucose reduced both the rate of rise of the action potential and its height. The rate of rise was directly proportional to [Na]o, while in accordance with eqns (3.2) and (3.3) the slope of the line relating spike height to log10 [Na]o was close to 58 mV until the point was reached where conduction failed. Subsequent experiments have shown that a similar relation holds good when [Na] is varied. In order to change the potential across a membrane whose capacitance is 1 ^F/cm2, from — 60 mV at rest to + 50 mV at the peak of the spike, the total quantity of charge transferred must be 110 nanocoulombs/cm2, which would be carried by 1.1 picomoles of a monovalent ion crossing 1 cm2 of membrane. A crucial test of the validity of the sodium hypothesis was therefore to measure the net entry of sodium into the fibre and the net loss of potassium from it during the passage of an impulse. 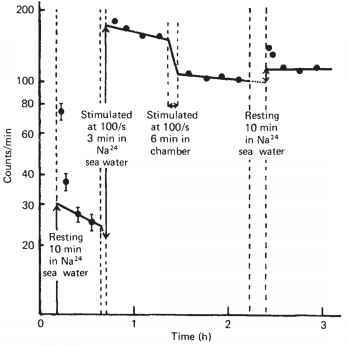 Using the technique of radioactiva-tion analysis, Keynes and Lewis (1951) found that in stimulated Sepia axons there was a net gain of 3.8 pmole Na/cm2 impulse and a net loss of 3.6 pmole K/cm2 impulse, while in squid axons the corresponding figures were 3.5 pmole Na and 3.0 pmole K. The measured ionic movements were thus more than large enough to comply with the theory. It was not surprising that they were actually somewhat greater than the theoretical minimum, because it was reasonable to expect that there might be some exchange of potassium for sodium over the top of the spike in addition to the net uptake of sodium during its upstroke and the net loss of potassium during its falling phase. Experiments with 24Na like that illustrated in Fig. 4.4 showed that there was an analogous exchange of labelled sodium during the spike as well as a net entry, for the extra inward movement of radioactive sodium was estimated as 10 pmole/cm2 impulse, and the extra outward movement as about 6 pmole/cm2 impulse, the difference between the two figures being in good agreement with the analytical results. Fig. 4.3. The effect of reducing the external sodium concentration on the action potential in a squid giant axon. In each set of records, record 1 shows the response with the axon in sea water, record 2 in the experimental solution, and record 3 in sea water again. The solutions were prepared by mixing sea water and an isotonic dextrose solution, the proportions of sea water being a, 33%; b, 50%; c, 71%. From Hodgkin and Katz (1949). Fig. 4.4. 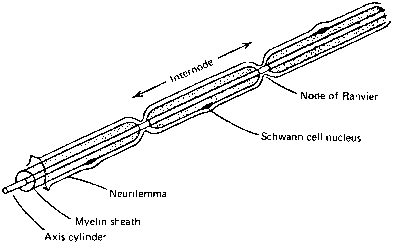 The movements of 24Na in a stimulated Sepia axon whose diameter was 170 ^m. The axon was alternately exposed to artificial sea water containing 24Na, and mounted in a stream of inactive sea water above a Geiger counter for measurement of the amount of radioactivity taken up. The loss of counts during the first ten minutes after exposure to 24Na resulted from washing away extracellular sodium, and was ignored. For the entry of 24Na, 1 count/min was equivalent to 42.5 x 10~12 mole Na/cm axon. Temperature 14°C. From Keynes (1951). Fig. 4.5. The regenerative linkage between membrane potential and sodium permeability. From Hodgkin (1951). membrane potential to its original level. At the end of the spike the membrane has returned to the normal resting potential, but its sodium permeability mechanism is still inactivated. Lapse of further time allows the sodium permeability to be reactivated, and hence restored to the quiescent state in which it is still very low, as is characteristic of the resting membrane, but is now ready once more to increase explosively if the system is retriggered. 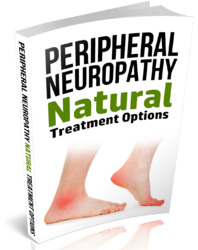 PNa in conjunction with an unenhanced outflow of K+ ions would bring back the potential, albeit more slowly, and some types of nerve fibre are able to dispense with the rise of PK.